Fed up with not having any exercise for the last week and a half, I decided to test out my knee on a short bike ride. Unfortunately the warmest it managed to make it to today was -22oC (-8oF) or so. 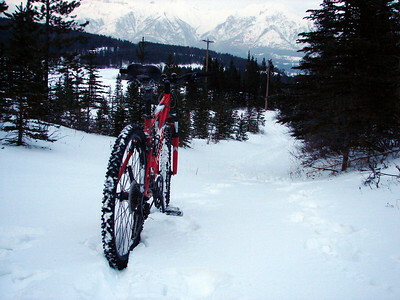 And there was a lot of snow around, so it ended up being a longer than planned bike ride with large sections of pushing. As I set out it was like a world of pastel though, with everything snow-covered and subdued sunset pink and blues soaking through. I went back out and cycled along my nemesis track – the powerline trail where I crashed and hurt my knee. Much less icy this time round. However I then made the mistake of turning off to cycle a loop along by the dam – I got bogged pretty much straight away, but for some reason decided to keep going. 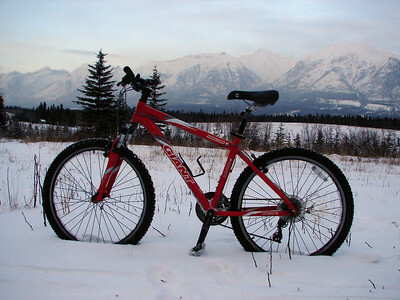 So the pushing began, as even deflated, my tyres weren’t fat enough to deal with the snow. The sun was setting – and I was getting colder. My eyelashes got lovely and icy – as did my eyebrows apparently. 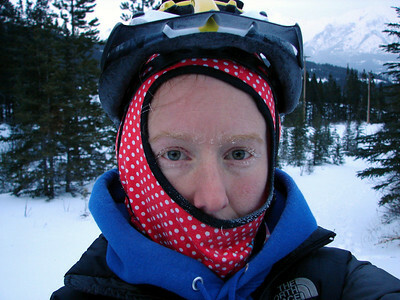 And yes, I have a red polka-dot balaclava. It means I look more like a Russian peasant than the serial killer or cat burglar looks that you get with the standard black balaclava, but I’m ok with that. You are sounding rather suspiciously like silly cousin George!! I was thinking “What on earth is he talking about, it wasn’t that silly”… although on re-reading, it does rather sound that way.